A new European project has an ambitious goal of cleaning up space for future generations. The Technology for Self-Removal of Spacecraft (TeSeR) program, introduced in May 2016, will develop a prototype for a module that will ensure that a defunct spacecraft pose no danger to other vehicles in space. The project is financed by the European Union's (EU) Horizon 2020 research and innovation program. Led by Airbus Defence and Space, TeSeR will receive EU funding of more than $3.1 million and the project will run through 2018. The company will act as the coordinator of the consortium of European partners, including universities and firms from the U.K., Germany, Denmark and Italy. Airbus will be responsible for project management, technical coordination and the development of innovative attitude control systems. 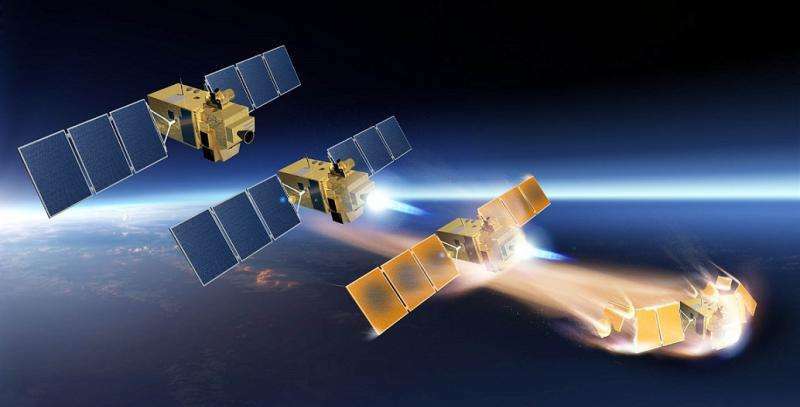 "With the TeSeR project, Airbus Defence and Space reinforces its position at the forefront of the development of technologies which aim to tackle the space debris issue," Mathias Pikelj of Airbus Defence and Space told Astrowatch.net. TeSeR project will focus on developing a removal module for spacecraft. Airbus Defence and Space will begin the development with the exploration of concepts, going for a functional design with the aim to manufacture and test an on-ground prototype module demonstrating the main functions. Under the TeSeR project, scientists and engineers will investigate three different removal technologies: solid propulsion, drag augmentation systems and electrodynamic tether. As each of these removal technologies has its specific advantages, it will be necessary to investigate how and when they can be used. "Depending on the orbit, mass, shape, and structure of a spacecraft, different removal technologies may be utilized. For example, heavy satellites in low Earth orbit require a controlled re-entry over an uninhabited area, whereas small satellites burn up in the atmosphere," Pikelj said. He says that the TeSeR module will not only act as the "smart interface" between the spacecraft and the removal subsystem of choice, but will be also equipped with the appropriate level of autonomy. "A minimum level of autonomy – for instance, regarding power supply and communications – is necessary to ensure the removal in cases where a spacecraft suffers a complete in-service failure," Pikelj noted. By launching the TeSeR project, Europe seeks innovative and cost-effective solutions allowing scalable system design for post-mission disposal of satellites and launcher upper stages that are in line with or exceed international and European guidelines and legal requirements. The project will also perform a thorough qualitative and quantitative mission analysis of existing removal concepts. Moreover, TeSeR could be used as leverage to propose changes in legal aspects and advanced state-of-the-art licensing standard for spacecraft including the improvement of international debris mitigation guidelines and standards. Airbus Defence and Space has a vast experience regarding space debris problem, running numerous projects concentrating on this issue. It has developed technologies allowing the collection and removal of larger pieces of space debris in orbit as well as in-orbit servicing, including the post-mission disposal. The company has also performed studies on overall system architectures for optimized space debris detection and tracking. The problem of space debris is emerging as orbital space is getting increasingly crowded. Defunct and uncontrolled satellites are effectively space junk. They are a dangerous source of even more debris if they collide. Collision events could put at risk activities in orbit around Earth and cause significant damage to the infrastructure in space. "Each uncontrolled satellite might collide with other satellites or other debris resulting in new clouds of new debris. An example of this is the Iridium-Kosmos collision in 2009," Pikelj said. This collision destroyed both Iridium 33 and Kosmos 2251 satellites. NASA estimated that the accident created approximately 1,000 pieces of debris larger than 4 inches, in addition to many smaller ones. "The issue has drawn the attention of governments, space agencies, spacecraft operators and manufacturers alike. The TeSeR project develops technologies that will significantly reduce the creation of new debris and, thus, ensure a sustainable space environment for future generations," Pikelj concluded.